PHOTO: Liberal MPs Fraser Ellis and Nick McBride outside Parliament after voting down debate on amendments to the Mining Act. A rebel Liberal MP “had no choice” but to cross the floor over debate on a contentious mining bill in South Australia’s Parliament, leading to him being labelled as “destructive” and a “bloody fool”. South East MP Nick McBride, along with fellow Liberals Fraser Ellis, Dan Cregan and Steve Murray, yesterday sided with Labor on three consecutive votes to postpone debate on the amendments to the Mining Act until next year. Mr McBride said farmers wanted the right to lock their gates to mining companies, but his own Government was not listening. 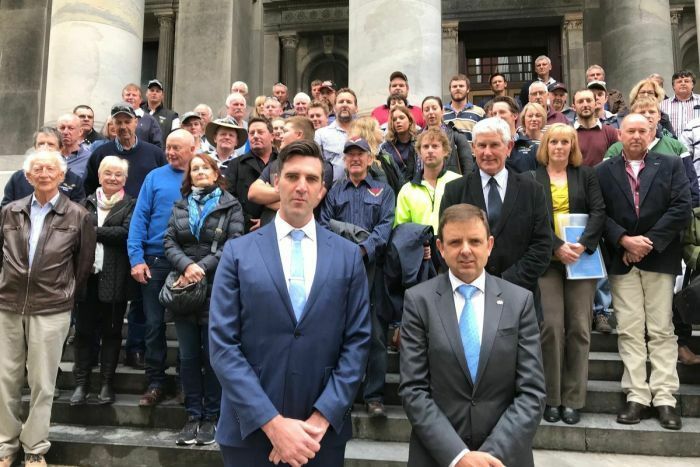 “We had exhausted all our communications and consultations with the [Mining] Minister, and we were trying to look after our constituents from the regional areas of South Australia over the amendments to the mining bill act,” Mr McBride said. “[Farmers] are very, very worried with the current play with the Mining Act. The State Government argues the bill will bring regulations up to date and drive investment in the sector. Fellow country Liberal MP David Basham said the bill struck the right balance between farmers and miners. “I’m not sure that we’ll ever find a position that everyone’s happy, but we are moving towards something that does improve it for the farming community and I think we just need to keep that journey going,” he said. Another country Liberal, Adrian Pederick, said he would support the bill. “I do struggle with the fact we have people willing to challenge this legislation, and I respect that, but the simple fact is this is an improvement, this is an improvement about land access,” he said. Although Labor may yet side with the State Government to pass the bill, it was revelling in the political chaos. “Premier [Steven] Marshall was humiliated today by losing three votes in the House of Assembly,” Opposition mining spokesman Tom Koutsantonis said. Opposition Leader Peter Malinauskas said there had not been an open show of government disunity like this for a long time. “There’s always been friction below the surface in Steven Marshall’s team and yesterday it bubbled over in Parliament in open warfare in a way that really undermines the credibility of the Government,” he said. The bill will return for debate in February 26, by which time Mr McBride said he hoped to change the Government’s mind on the legislation, which he said was too similar to one proposed by Labor last year. 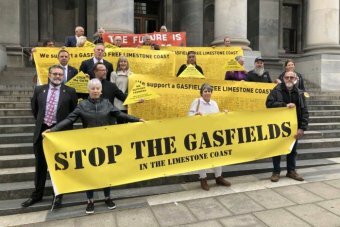 “All we’ve done is save the Government from complete turmoil amongst our own key constituents and Liberals from our regions and particularly the Yorke Peninsula where they can be heard, can be negotiated and brought on board with changes to this bill,” Mr McBride said. Mr Ellis said farmers “want a better deal” and “stronger land rights”. “The current bill on the table does not go far enough on the key issue of land access,” he said. The South Australian Chamber of Mines and Energy is strongly in favour of the amendments. Mining Minister Dan van Holst Pellekaan said there had been “extensive community consultation” on the bill. “There are enormous benefits for farmers and the mining sector,” he said. “We need both of those sectors to succeed. “Unfortunately, what we saw yesterday was the Labor Opposition deserting both landholders and miners and the Parliament. “This is a bill which they said they would support and purely to play politics they’ve not decided not to do that. Farmers travelled to Adelaide and filled the gallery during the debate and vote. Yorke Peninsula grain grower Bill Moloney said he was pleased with the result as it would allow more opportunity for consultation. “I think that’s what people were pretty cranky about was the fact that they [the Liberals] were doing what the Labor Party had tried to before — rush it through during harvest time when there was going to be less chance for having some decent debate,” Mr Moloney said. Mr Moloney said farmers have been disappointed by what they believe is a lack of meaningful consultation with the agriculture industry, despite Liberal Party promises before March’s state election. 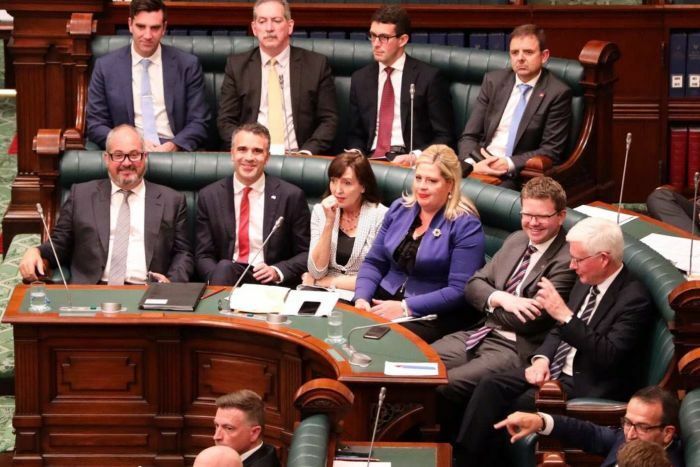 “The four Liberal Party politicians who crossed the floor, they did a very brave thing today and they showed a lot of guts by doing that,” Mr Moloney said. 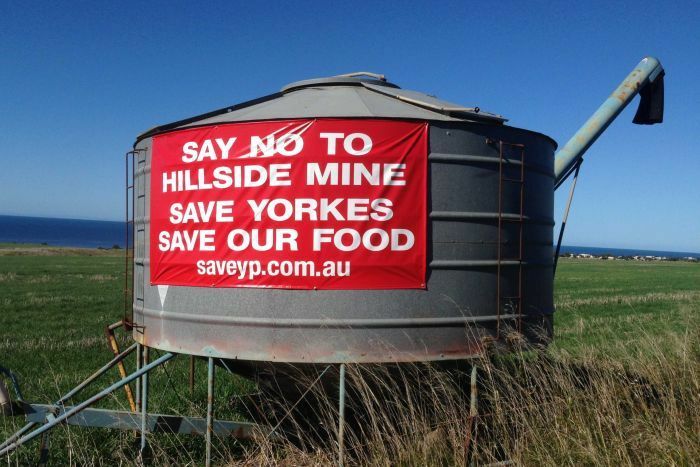 Another farmer, Steve Lodge, who is a member of the Yorke Peninsula Landowners’ Group, said the bill was “heavily balanced towards the exploration of mining companies”. “What the bill is proposing is even more balance towards mining — it’s not actually giving the farmers any benefits; it’s actually encroaching more on their rights,” he said. Mr Malinauskas said it was odd that Transport Minister Stephan Knoll was not in Parliament for the vote and did not have a pair. “Missing a division, particularly when you’re a Cabinet minister on a contentious issue, is simply unheard of,” Mr Malinauskas said. In a text message to ABC Radio Adelaide presenter David Bevan, Mr Knoll denied abstaining from the vote. He said he missed the first vote by 10 seconds while talking to SA Best MLC Connie Bonaros about wind farms, but voted with the Government on the next two occasions. In September, the Government put in place a 10-year moratorium on fracking in the south east after promising to do so at the state election. The Labor Party opposed the move.